Management, and front desk are terrible! Our family has stayed here several times each time the the customer service got worse. The rooms are small but, decent, the location is perfect we have a daughter that lives walking distance and we like being close to the shopping. We will not be staying there again which is a loss for them since we come every couple of months and usually get 2 rooms one for our other daughter. On our last visit I accidentally left my favorite items of clothing in one of the drawers in the room. I called immediately when I realized this and was sent to housekeepings voicemail I left several messages including one for the hotel manager and never heard back. finally 4 days later I was able to get through to the manager of housekeeping he was rude, didn't speak enough english to get my name right after repeating it and spelling it over and over he finally figured it out just to tell me that my clothes were not there because the housekeepers would have put it in the log book. I begged him to please just look in lost and found and described my items and he refused. I lost about 1500.00 worth of non replaceable items. Yes, I know it's my fault for leaving them I am just so sad about it. Okay hotel. I felt service was lacking, check in was minimal and I was left to my own devices a bit. Room tiny but okay for one. Decor was odd, I didnâ€™t get the blue tinted mirror taking up a whole wall, made the room feel cold. Food very good, breakfast nice. I had issues with the shower and had to get handyman in. I donâ€™t think I would stay again. We appreciate the feedback, Hollie. We're disappointed your time with us was less than ideal. We care deeply about the satisfaction of our guests so we regret that our service and amenities didn't meet your expectations. Thank you again for your feedback. We'll be sure to address your concerns with our team moving forward. 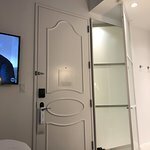 I stayed for the second time this year at the Nomo Soho Hotel came back because the the previous experience I had - back in February this year, was excellent. The location of the hotel is probably one of the best - in the heart of Soho (the hippest place to be in NYC), everything is close by, the trains station is a block away, great restaurants & bars all around (even a karaoke place right across the Lafayette entrance), and amazing stores at every meter. And it has a nice terrace right in front! The staff was very nice, in particular the Manager of the hotel- Mr. Pablo - who was incredibly attentive, always eager to meet the needs of its customers. The room i stayed in, 2001, was a great one, just a bit noisy from overseeing Lafayette street. I asked if I could change the room and immediately i was offered more options. As well, Jeffrey, the front desk agent, such a respectful man, always smiling and eager to be of service. There was a free wine tasting every day at 5 PM in the hotel's lobby, sometimes fresh fruits or other treats awaited at the entrance of the hotel- making one's stay feel so much closer to home. I have stayed here over the past years many times, and I have to say that in the last years I was quite disappointed with the staff and the fact that I had booked through a third party - Hotels.com, that had hidden taxes...So, this year, when i was back , I was a bit reluctant, but the place had changed so, so much for the better. I was amazed. I stayed in total this year over three weeks here and I don't think I could have made a better decision. I highly recommend it! Thank you for the outstanding review, Ala! It's a design hotel,very nice, but the rooms are very small and the bathrooms really tiny. I don't think I will stay again in the future in this hotel. Dear Guest, we appreciate the feedback. We regret to hear that you were unsatisfied with your room. We aim to provide our guests with the most comfortable experience possible, and we'd love to help you reserve a room that better suits your individual needs of space and comfort in the future. We hope for the opportunity to share a more positive experience with you soon.